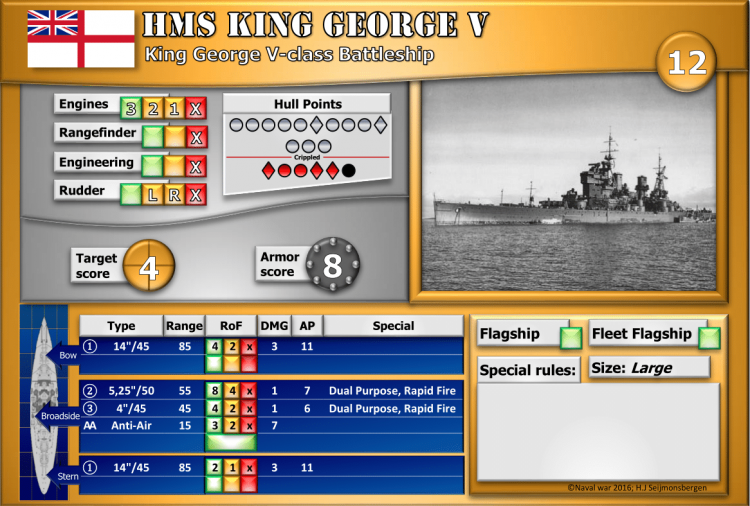 The King George V class battleships (KGV) were completed for the Royal Navy early in World War Two. Five ships of the class were built: King George V (1940), Prince of Wales (1941), Duke of York (1941), Howe (1942), and Anson (1942). They carried one quadruple and one high "super-firing" twin turret forward and one quadruple turret aft. In this unique layout, she carried ten 14-inch guns. Her secondary armament consisted of sixteen 5.25 inch guns clustered amidships in eight double turrets.Two widely spaced tall, flat-sided stacks distinguished the ships of this class. Designed by the Admiralty in 1936 under the restrictions of the Washington Treaty.